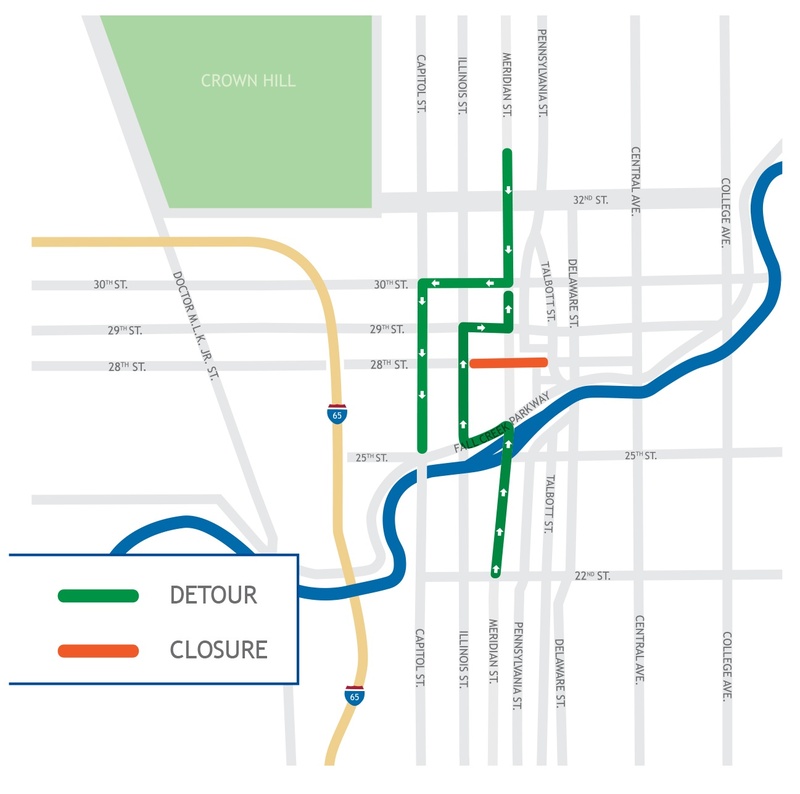 INDIANAPOLIS – From January 2 through October 31, 2018, downtown commuters will be impacted by the closing of Meridian Street at 28th Street as a result of the DigIndy tunnel project that is being constructed to clean up Indianapolis’ waterways. Additionally, 28th Street will be closed east of Illinois Street to Pennsylvania Street for the same period. Detour routes will be clearly posted beginning at 30th Street from the north and Fall Creek Parkway from the south. Commuters should take precaution and follow all posted signage. Click here to view the detour map (subject to change) and additional information. Major elements of the project in this area include two large sewers (325 feet of 36-inch pipe and 560 feet of 60-inch pipe) to capture and divert combined sewer overflows to the Fall Creek Tunnel, a portion of the DigIndy Tunnel System to be complete by 2025. Sidewalks, curbs and pavement will also be restored as part of this project. DigIndy is a federally mandated project to build a 28-mile long network of deep rock tunnels 250 feet beneath the city. The tunnels will store 250 million gallons of sewage and storm water during rain events and nearly eliminate about 6 billion gallons of annual overflows to area waterways by the year 2025. DigIndy will help restore area rivers and streams, enhance recreational opportunities and drive community revitalization and economic development. “While we understand the frustrations commuters may have over the next several months, this project will help clean up our waterways to levels not seen in over 100 years and produce benefits that will last for generations to come,” said Citizens Energy Group President & CEO Jeffrey Harrison. To learn more about how the DigIndy Tunnel System will improve our community, visit DigIndyTunnel.com. For construction updates, follow us on Twitter: @DigIndy. Visit CitizensEnergyGroup.com/Construction to view all projects on the Citizens construction map.